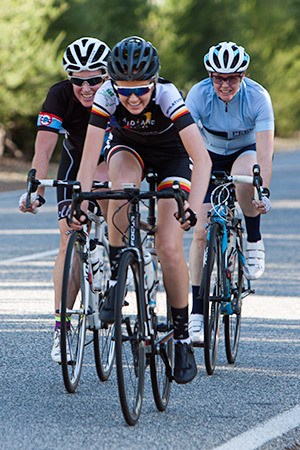 Sunshine and 30 degree temperatures greeted the riders for the start of the Club’s winter road race season in Serpentine last Saturday afternoon. In addition to the usual five grades of racing, two grades of women’s only racing and a junior development ride was on offer. With budding junior racers riding one lap of the 9 kilometre circuit under supervision. Unfortunately, there was not enough riders for a competitive women’s advanced race and most competitors choose to race in the mixed grades instead. Adelia Neethling, who represented South Africa in track cycling at the recent Commonwealth Games, decided to fly the flag for women’s cycling and rode a solo effort against the clock, putting in some impressive lap times. The women’s development race saw a trio of riders Lauren Backshall, Heather Connan and Jasmyn Quick establish a small break over Michelle Baker and Nikki Sime on the first lap, dropping all other riders. Over the next three laps the trio maintained their small buffer from the chasing pair, despite the best efforts of Sime to close the gap. In the end Quick lived up to her name sprinting to take the win, with Backshall second and Heather Connan third. Mixed E grade saw a couple of women have their introduction to racing at a less frantic pace than the women’s development race. Unfortunately E grade were first on the scene of a crash in B grade and only two riders finished. D grade had a couple of injections of pace on the second and third laps, dropping riders. Which saw four rider take the bell for their fifth and final lap. 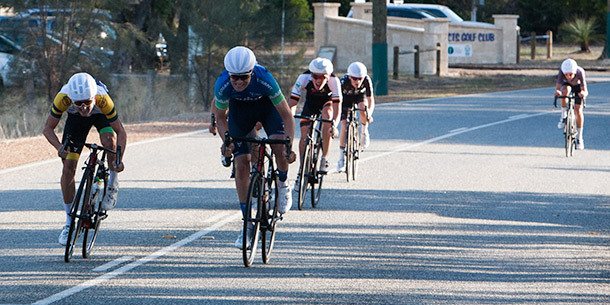 The group stayed together, picking up speed along Karnup Road until the sprint which was won by Roger De Pontes, with Peter Barclay second and Paul Taylor third. The pace was on in C grade from the start, riders were being dropped every lap. The paced picked up on the second half of the sixth and final lap, with only 10 of the almost 30 starters contesting the sprint finish which was won by Calum Milne, with Michael White second and Mark Duchesne third. After five laps of racing, B grade was abandoned after a Matthew Connan crashed and had to be taken to hospital. The good news is the Matthew will make a full recovery. There were a lot a young faces in A grade, including a few making their debut. The racing as usual was frantic, attack, chase, counter attack, the pace never eased and a lot of riders were dropped…After seven laps, a group of six riders had established a small break, with none of the group over the age of 20. The final lap was the fastest of the race, with all six contesting the sprint, with National Under 19 Road Race Champion Tyler Lindorff narrowly taking the win from the “old man” of the bunch 19 year old Conor Leahy with Sebastian Barrett taking third.